"This is an easy to make Asian inspired recipe for chicken in a pressure cooker. It has a subtle sweet and sour taste to it. Serve over white rice with a side of stir fried broccoli." Heat the olive oil in the pressure cooker with the lid off, over medium-high heat. Add chicken and brown on all sides as evenly as possible. Remove chicken from the cooker, and season with salt, pepper, paprika and marjoram. Drain and discard fat from the cooker, and mix in wine and chicken broth, scraping any bits of food that are stuck to the bottom. Return chicken to the cooker over medium-high heat, secure the lid, and bring to high pressure for 8 minutes, or until the chicken is tender. Reduce pressure before opening the lid. The internal temperature of the chicken meat should be at 180 degrees F (82 degrees C). Remove chicken to a serving dish, and add the apricot preserves, vinegar, ginger and honey to the pot. Bring to a boil, and cook uncovered until the sauce has reduced into a thick and syrupy consistency, about 10 minutes. Spoon over chicken and serve. 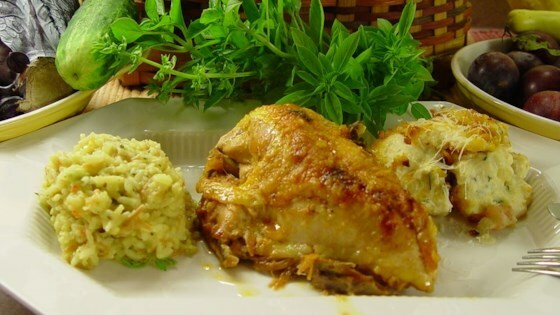 See how to make juicy “baked” chicken in the slow cooker. Very bland. Too soupy. I had to boil off 1 - 1.5 cups of the water after releasing pressure. It is missing something, but I don't know what it is. this recipe was wonderful and so easy. the sauce tasted even beter on the leftovers the next day. thanks for sharing it. An absolute phenom! I use my pressure cooker only 3 or four times a year, but now I'll use it more. This recipe is no doubt one of my top ten best meals ever. Excellent! This is awesome. My family raved over this. The chicken was soooo tender and moist and the sauce just took it to another level. Extremely easy. Will definitely be making this often. Thanks for a fast and easy recipe - I left out the white wine, substituted water and it still had plenty of flavor! Very good and Very easy... Make sure to atleast double the sauce, perhaps even triple it and be sure to cook the chicken in the sauce. Then thicken it after the chicken is done.